So here we are on the 9th day of this marathon and my family’s enthusiasm for dosais has begun to wane. Also, my maid has started sighing and rolling her eyes when she sees the grinder / mixer in the sink to be washed every alternate day. So now I have to figure out different dosais to make with the same batter in order to run the rest of the marathon. I tried explaining the concept of mega marathon to my maid who asked if I couldn’t have made the dosais in advance. Well, I definitely need to start preparing for the mega marathons in advance. The idea for this recipe is from my sister-in-law. 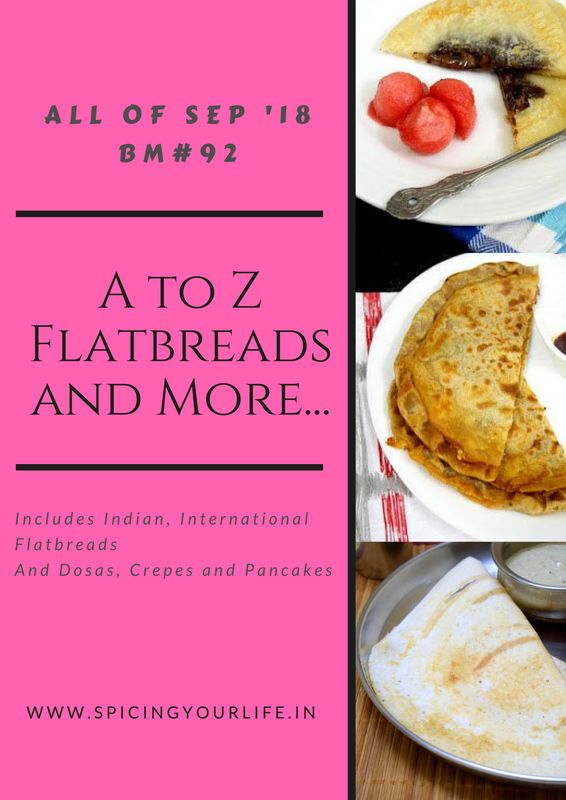 She and her roommates would make these simple quick dosais for breakfast or dinner on days they had too much work and too less time. This is a simple idea of mixing pickle with dosai batter and making delicious crisp dosais which does not need any side dish and can be had on the go. So when I was stuck with trying to find a dish for ‘I’, my eyes fell on the delicious ginger pickle sitting on the counter and thus was born the Inji Thokku dosai. If you are in Chennai, do pick up all the pickles / thokku from the Ganga Sweets chain. They have a lovely range and are super delicious. Luckily they have an outlet near our house in Chennai and the husband and I make a mandatory trip to their shop to stock up on sweets, savories and pickles to last till our next Chennai trip. Pickled dosa ! Wow ! That is interesting . Must be so lip smacking , the idea of a pickled Dosa is making me drool . Well if the North Indians can make Achaari Poori / parathas , why can’t the South Indians make Achaari idli Dosa ? Wow this is again an amazing dosa, adding thokku in dosa batter is definitely a brilliant idea Sowmya, seriously am amazed to see this dosa for I. Well done and kudos to you to come up with this inviting dosa. Adding thokku will make dosas so full of flavour. Even thinking about it makes me drool. Your dosa has turned out super crispy. We make Erra karam dosa with onion chutney smeared on the dosa but using ginger pickle in the batter itself is genius. Super idea. Hahaaa how we get scared of our maids. Mine is tired of having to clean the tawa everyday especially when I’ve made the flatbread using oil.. and then she can’t stop staring when I take photos. She probably thinks I’m mad. Adding a pickle to the dosa batter is a good idea. I can imagine how tasty it must have been on its own. Interesting way to add the pickle in dosa batter. I do such things casually at times but never knew it really existed. The dosa looks so crispy. Maids….I am mad at myself for not planning in advance! We had a flatbread overload and it is a good lesson to start early in the future. Between, this will be a feast to my husband when I pack the inji thokku smeared dosai for him. What an interesting Dosa recipe Sowmya! Until I read the post, I thought you smear the dosa with a layer of inji thokku! Ok,I am now seriously drooling.I have some spicy tomato thokku, and I need to make this !Super recipe Sowmya. This is really such a twist to the regular one Sowmya, loved the idea, will surely make Aavakaya Dosa soon..hehehe..
Wow.. never thought ginger pickle in dosa.. quite unique and tasty.